Author's Note (2010): This article was researched and written in 2007 as part of the preparation for our year-long Journey on the Wild Coast. One of the goals of this trip was to see many of these issues for ourselves, and to weave them together into a narrative aimed at understanding natural resource issues facing the Northern Pacific Coast. Some of the text and links have been updated with more recent information. See the current version of our website here, where we discuss Coal, Metals Mining, Forestry, Fisheries, Oil/Gas, Renewable Energy and Climate Change. See also our Reflections at the end of this article. Exploration at proposed PebbleFish can be harvested every year. Forests regrow on a time scale of centuries. But oil, coal, and metals are formed by geologic processes with a time scale of millions of years. These mineral resources are non-renewable. And while fish and trees take their place as a key part of the ecosystem, minerals lie deep beneath the living earth, and are important to no species but our own. The key issues in this region are the proposed mines in Bristol Bay, and in Northwest B.C/Southeast Alaska and the proposed offshore oil drilling in Bristol Bay and off the B.C. coast. Many of these areas are remote, and currently undeveloped. Their fate is still being decided. Projects with unacceptable negative impacts can still be stopped. Other projects can be redesigned for better accountability, better returns to local government and communities, and better envrionmental standards. Information on this page is gleaned from a number of excellent references, listed at the end of the page. Local footprint - the area directly destroyed by mining or drilling operations. This is a planned part of the operation, and can be many square miles for coal mines and open pit metal mines. Accidents - contamination of land or water by spills or leaks of toxic substances. Oil spills, acid mine drainage, heavy metal contamination, etc... These toxic substances may be present in the mined material or added in the extraction process. Mitigation measures are supposed to prevent this, but often fail. Water pollution is one of the biggest problems at mines. This map shows some locations of current, proposed, and historic mining and drilling operations along or near our route on the Northern Pacific and Southern Bering Sea. There are almost certainly locations missing - especially historic mines and relatively undeveloped proposals. Feel free to contact me with proposed additions. Metal ores are often found in regions of ancient volcanic activity. This coastline is part of the Pacific Ocean's "Ring of Fire", and ores of gold, silver, and copper are common in several regions, particularly in Northwest B.C./Southeast Alaska, and in Southwest Alaska near Bristol Bay and the Alaska Peninsula. Some sites in these regions have been historic targets for mining, but remote locations and low grade ore have often prevented development. However, in the past few years, worldwide metal prices have doubled or tripled, leading to a boom in claim and exploration activity in both B.C. and Alaska. Though the gold rush is one of the best known pieces of Alaska history, the days of grizzled old prospectors in the mountains with gold pans are long gone. Modern mines are generally very large enterprises run by multinational corporations, and extract their metals from ore in open pit or underground mines. Their local footprints can be enormous (over 20 square miles in the case of one proposal - the Pebble Mine prospect). However the infrastructure and energy needed to run these mines is even larger - often leading to more oil drilling, coal mining, or hydropower dams to power the operations. However, the biggest impact from mining operations is often not from their planned footprint and infrastructure, but from accidental spills and leaches of contaminants into nearby waters. Mining is the most polluting industry in the country ( EPA Toxics Release Inventory). Major threats to water include acid mine drainage, cyanide spills, and heavy metal pollution. Fish are especially sensitive to heavy metals in the water (more than people). According to the Environmental Protection Agency (EPA), mine waste has contaminated more than 40 percent of the headwaters of western watersheds. Acid mine drainage occurs when naturally occuring sulfides in mined rock react with air and water, forming sulfuric acid. This acid leaks into streams, lowering their pH, and making them uninhabitable by fish and other aquatic life. Sulfides (like pyrite) are often found in ores containing copper, gold and silver. Sulfides are also common in coal seams. Under natural conditions, these rocks erode very slowly, leaching only minute amounts of acid into local waters. A mine can unearth in decades as much rock as normal geologic processes would erode in a million years, allowing all the acidification to occur at once. Acid mine drainage is very difficult to prevent, and is often one of the most problematic and long-lasting environmental impacts from a mine. 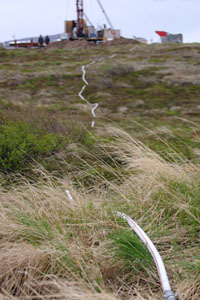 It has been documented at both Greens Creek and Britannia, and is a major worry for the proposed Pebble Mine. Britannia- An abandoned copper mine on Howe Sound just north of Vancouver. One of the most notorious sites of acid mine drainage and water pollution in North America. Kennicott - An abandoned copper mine in the Wrangell Mountains. A railroad ran down beside the Copper River to connect the mine with the port in Cordova. The railroad is abandoned, but a road still runs from Cordova to the newly-reconstructed "million dollar bridge" over the Copper River. Lituya Bay - Early in the 20th century, gold prospectors mined the beach sands here. Greens Creek - An underground mine for silver, gold, zinc and lead, on the northwest end of Admiralty Island, in Admiralty Island National Monument in Southeast Alaska. See our detailed article here. Eskay Creek - An underground gold mine in Northwestern B.C., on a tributary of the Unuk River. Part of Iskut-Stikine volcanic belt - a rich mineral area near the border with Alaska. Earle Creek - A gravel mine near the town of Egmont, B.C. Myra Falls - An underground zinc, copper, gold, and silver mine near the town of Campbell River, B.C. Quinsam - A coal mine on Vancouver Island near the town of Campbell River, B.C. Windy Craggy - In the 1980s, Geddes Resources put forward a propoasl to develop this mine - a large open pit copper mine in the Tatshenshini-Alsek watershed, on a peak between the two rivers. Acid mine drainage from the sulphide-rich ore would have posed an enormous threat to both rivers and the surrounding wilderness. A group known as Tatshenshini Wild formed in 1989 to fight this plan. With growing opposition to the plan, Tatshenshini Wild spearheaded a large coalition known as Tatshenshini International. At it's peak, the group comprised 50 of the top conservation organizations in North America and represented about 10 million people. In the end, two things stopped the mine project: strong public opposition, and the objections of the U.S. The U.S. stood little to gain from the mine, which threatened fish runs in U.S. waters, and since the only feasible port for Windy Craggy was in the U.S. at the mouth of the Alsek, the U.S. could have vetoed the project by refusing the port. In 1993, this wilderness was protected in the Tatshenshini-Alsek Provincial Park, creating the only large river drainage in North America that is protected from headwaters to ocean. Quartz Hill - This molybdenum deposit is located in Misty Fjords National Monument in Southeast Alaska. US Borax staked a claim here in 1974, and in 1980 the Alaska National Interest Lands Conservation Act created the National Monument with a hole in it, to exempt the potential mine site and its access corridor. By 1991, some disposal permits had been denied and the price of molybdenum had dropped, making the prospect no longer worthwhile. Canadian mining company Teck Cominco owns the site now, and continues to assert the mine will be developed when molybdenum prices rise enough. Prices have risen a lot in the past several years. This is the category we'll be paying the most attention to. Why? These mines haven't been built - and in many cases may not be built. Public attention and public participation can still influence these outcomes - either to prevent the mines, or to demand better accountability and envrionmental standards. The Pebble Mine project is a controversial proposal by Northern Dynasty Minerals to build one of the largest gold and copper mines in the world, in southwest Alaska, near Lake Iliamna. Their current proposal involves both a large open pit and an underground mine, as well as removal of the water from the headwaters of Upper Talarik Creek and the Koktuli River (important fish habitats). The site sits at the headwaters of two major Bristol Bay drainages ( Nushagak and Kvichak), and potentially poses a large threat to the region's water and salmon. This proposal has become a major political issue in Alaska, supported by the mining industry and heavily opposed by the commercial and sport fishing industries, and many local native villages. Read much more about Pebble Mine in our up-to-date detailed article here. The Chuitna Coal project is a proposal by PacRim Coal to develop Alaska's largest coal strip mine 45 miles west of Anchorage in the Beluga Coal Fields, near the communities of Tyonek and Beluga on the West side of Cook Inlet. Check out our new and up-to-date Chuitna page. Galore Creek - The Iskut, Unuk, and Stikine Rivers are major transboundary waterways that flow from B.C. into Southeast Alaska, and important habitats for both fish and wildlife. They're also located in the Iskut-Stikine volcanic belt, a rich source of metal deposits. Novagold has permits to build this Galore Creek Mine on the lower Stikine river, 20km from the main stem. Potentially, they could also put in a hydropower dam in Forrest Kerr Canyon on the lower Iskut, which would dewater a significant portion of the river. Kensington - An underground gold mine which recently opened near Juneau by Couer Alaska. This mine was at the center of a major legal battle over the Clean Water Act. Kensington sought to reclassify mine tailings as "fill", in order to dispose of them in a sub-alpine lake near the mine. Under the Clean Water Act, tailings cannot be disposed of in lakes or streams. Eventually the US Supreme Court issued a ruling in favor of the mine, and the mine began production in 2010. See our updated article here. Other Iskut River Prospects - There are many potential mine sites in the Iskut and Unuk watersheds. Skyline Gold is exploring the Bronson slope deposit on the lower Iskut River, near the old Johnny Mountain and Snip Mines. Other Southwest Alaska Prospects (e.g. Kamishak and Bee Creek) - A number of companies have claims and prospects in Southwest Alaska outside of the immediate Pebble Mine area. Most of these are relatively early in the exploration process, and are difficult to find much information on. Two properties currently being explored by Full Metal Minerals are Kamishak, (near the town of Kakhonak, Katmai National Park, and the McNeil River state Game Refuge) and Bee Creek (near the town of Chignik on the Alakas Peninsula). With the exception of the Chuitna coal proposal, most mines and mine proposals in this region are seeking metals. Metals are highly recyclable goods, and could theoretically be reused many times. Oil, on the other hand is largely burned for energy - truly non-renewable in all senses of the word. Burning oil and gas is a major contributor to global warming, which is already disproportionately affecting Alaska. Most oil drilling and proposed drilling in this region is off shore - where potential impacts include seismic exploration and oil spills. Another major risk is oil spills from tanker traffic - wherever the oil is drilled. Katalla - Near the Copper River Delta, Katalla was the site of Alaska's first oil well in 1902. Exploration also occured here in the 1980s, but the area is currently closed. Mt Demian - A 1920s era oil camp near Mt. 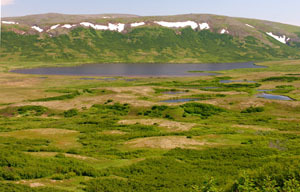 Peulik on the Alaska Peninsula. Cook Inlet - Offshore oil drilling has been going on in Cook Inlet since the 1960s. The Cook Inlet beluga whale population is in dramatic decline - the National Marine Fisheries Service has proposed that it be listed as endangered (2007). But Cook Inlet is the most populated waterway in Alaska, with multiple industrial activities and pollution sources. It's unclear whether or how oil drilling may have played into the whales' decline. 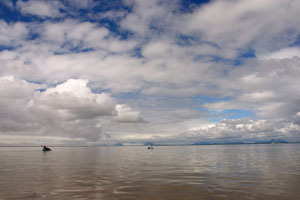 In spring 2007, the federal governement lifted the moratorium on leasing in the "North Aleutian Basin" area in Bristol Bay. This area of sea floor is located in the Bering Sea, north of the Alaska Peninsula. The Bering Sea produces half of all fish caught in U.S. waters, and Bristol Bay is home to the world's largest sockeye salmon fishery. In the winter, the Bering Sea is covered with sea ice, and known for its massive winter storms, greatly increasing the risk of a potential oil spill. These winter storms have led to a number of shipwrecks on the ice-free Pacific Ocean side of the Alaska Peninsula. We currently have no technology to stop the spread of an oil spill in partially-frozen waters. Offshore oil and gas leasing in the U.S. is under control of the Minerals Management Service. Bristol Bay was under a moratorium on leasing from 1990-2003, which was extended by President Clinton to 2012. President Bush undid Clinton's order in 2007, and the Minerals Management Service was considering selling leases in Bristol Bay, as well as the Chukchi and Beaufort Seas in the Arctic. There has been a moratorium on offshore oil and gas drilling in B.C. since 1972. The B.C. government would like the moratoruim lifted, but needs the federal government to agree. A 2003 review of the moratorium failed to come to any conclusions, and the moratorium remained in place. In its 2007 energy plan, B.C. continues to push for oil drilling to be allowed. Queen Charlotte Basin - between the Queen Charlotte Islands (Haida Gwaii) and mainland B.C. is one of the main targets, with known oil and gas reserves. The Queen Charlotte Basin is an especially rich area for marine flora. Risks of exploration and drilling off B.C. include oil spills (very difficult to contain in windy winter months), seismic testing (likely harmful to whales), and release of pollutants into the waters through normal drilling operations. One of the major risks with oil isn't from drilling at all - it's from tanker traffic. The Exxon Valdez oil spill that devastated Prince William Sound in 1989 came from arctic oil - drilled hundreds of miles away in Prudhoe Bay. Oil tankers have been banned from the B.C. coast since 1972, but the prime minister is currently trying to lift the ban (2007) - hoping to use the B.C. coast as a port for Alberta oil. While we walked through miles and miles of clearcut forests, and paddled past dozens of fishing boats, in a year of travel we saw very few mines. Along most of our route, mining was in limbo. Small-scale prospecting left its mark on Alaska history, but has faded into an occasional hobby. Beyond the prospecting, most old mines were small, and often hidden underground. Today, geologists drill cores and helicopters fly over remote swaths of wilderness, planning huge industrial complexes that dwarf anything that has come here before. We have the luck, and the responsibility, to be making decisions about these lands now - when we can look back at similar projects across the country and around the world. Moving beyond this expedition, we have put more of our focus into the future of Alaska's coal resources. Though Alaska possesses vast amounts of coal, little has been developed, and few people are aware of it. Through potential impacts to both local ecosystems and the growing problem of global climate change, I believe this is one of the larger issues facing the region today. Golden Dreams, Poisoned Streams: How Reckless Mining Pollutes America's Waters and How We can Stop It - Mineral Policy Center, 1997. 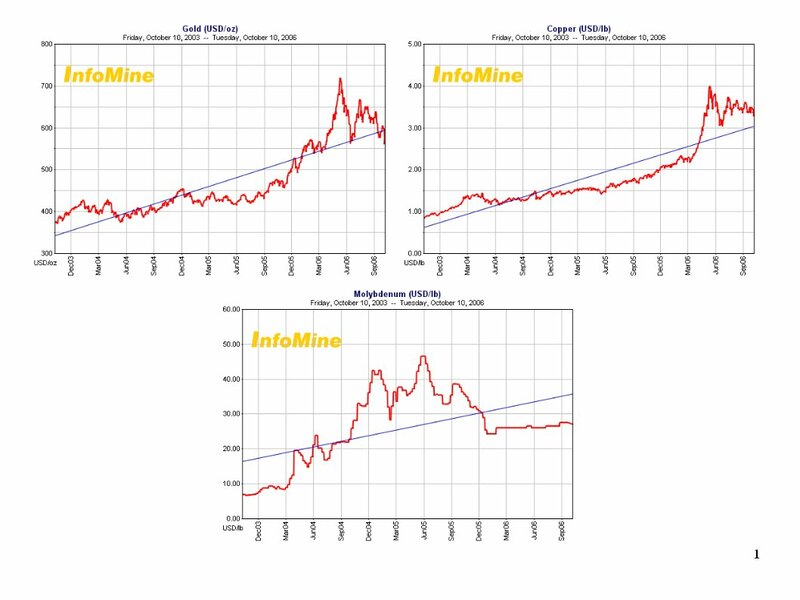 Mining Watch Canada - B.C. Earthworks - a non-profit organization dedicated to protecting communities and the environment from the destructive impacts of mineral development, in the U.S. and worldwide. Rivers Without Borders - Iskut, Stikine, Taku, Unuk rivers. Environmental Mining Council of B.C. Alaska Oil and Gas - Department of Natural Resources.